I’m not sure you can ever have too many vegetables in the house at once but at this time of year with the peas in the garden, the veg box and whatever looks tempting at the farmers’ market I can find it a little challenging to close the fridge door. You know it’s got a bit excessive when your carrot fronds are getting in the way of the door seal. If you find yourself fighting some spinach to reach the butter or battling beans to get to the mayonnaise there’s only one thing for it: make a minestrone. 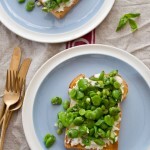 Prepare the broad beans by adding the beans to a pan of lightly salted boiling water. Cook for 3-4 minutes before removing, running under cold water and then squeezing the beans out of their grey skins. Set aside. Put a large pan on a low heat and add the olive oil, garlic, carrot, onion and courgette. Put a lid on and leave to soften for around 10 minutes. Remove the lid and add the tomato, summer greens and peas then pour in the hot stock. Bring to the boil then add the pasta and a little salt and pepper. Reduce the heat to a simmer and put on a loose fitting lid. Simmer for 8 minutes then add the prepared broad beans and continue to simmer for a further 2 minutes. I love mini pasta, I know it’s normal pasta just much smaller, I do think it’s somehow more enjoyable that way. This made enough for two large portions or for two smaller portions with enough for a generous lunch the next day. The colours of this soup are so vibrant at this time of year and the varied shapes and textures of the vegetables make it interesting. 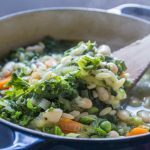 This minestrone is clean, fresh and delicious and most importantly frees up some room in the vegetable drawer. You should have some of that Leaf Celery stuff that I’m growing. It’s brilliant for soups and stock. Very savoury, “umami” flavour. Mini pasta is fun to eat. Fresh broad beans are the best. I like mini pasta too – it’s cuter and more fun to eat! 🙂 Great recipe! Is it a salad or is it a soup!? Great recipe! what a delicious use of garden goodies! Yum to this veg dish, Love the flavors and those beautiful colored veggies. 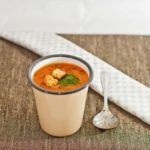 What a great combination of flavors in this summer minestrone. It’s beautiful too! Brilliant recipe! We do sometimes have too many veggies in the summer (sounds weird to say, but it’s true) and this would be a great way to use them. Really good stuff — thanks. Surely delicious! A great dish. Very pretty! Nice photos, loved it!